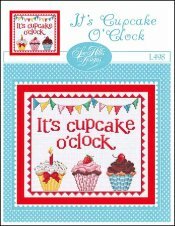 It's Cupcake O'Clock [G8738] - $12.00 : Yarn Tree, Your wholesale source for cross stitch supplies. Cross stitch pattern by Sue Hillis Designs. The only time that matters is "Cupcake O'Clock!" Choose your cupcake..a cupcake with sprinkles & a candle, a cupcake with strawberry frosting with a fresh strawberry on top or a cupcake with chocolate frosting & a cherry on top. Don't worry, you don't have to choose just one. When you stitch this design, you get all three. Quit licking your lips & get to stitching! Stitch count is approximately 118W x 104H.